TEENAGER Josh Corner scored his best result to date when he crossed the line second in Sunday’s feature Motorpoint British Supersport Evo Championship race. 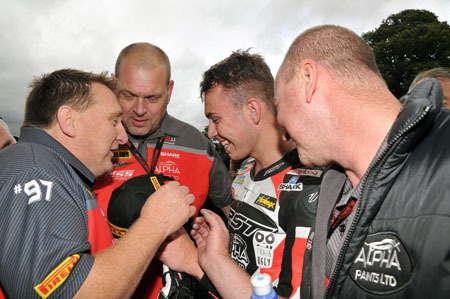 The 17-year-old – who was almost forced to pull out of the event due to lack of funds – bounced back from a tough sprint race on Saturday afternoon at Oulton Park where he finished sixth in class and 18th overall on his MJJ Motorsport/Alpha Paints Ltd Kawasaki. After Saturday’s dry race, Sunday’s threatened rain storms arrived early in the morning, but the rain had cleared by the time the Supersport pack took to the grid later that afternoon, although the track was still wet. Starting from 20th position, Corner got a lightning-quick start, forcing his way through the pack and was up to 14th overall by the end of the opening lap – and second in the Evo class. He held the place for the opening eight laps, dropping one spot on Lap Nine when he was passed by Evo series leader Alex Olsen. Corner kept close behind him, sticking with him for the remainder of the 15 lap race. On the final lap he made his move, searing back past Olsen and back to second Evo and 14th overall. He’d done enough to keep position to the chequered flag, where he celebrated his best result in the class to date. “It’s been brilliant, I’m over the moon with this result, especially after yesterday,” he said. “I wasn’t happy after the first race, I felt I could’ve went a lot quicker and I was a bit disappointed. “Then today we weren’t even sure if the race was going to happen. When I woke up this morning to the sound of heavy rain I thought it may be off. Then it brightened up and once we knew it was on, I was confident because I’ve always ridden well in mixed and changeable conditions. “It was a great race. I knew I had the pace as soon as I got off the line, and when Olsen went past I knew I had to keep him there so I could have a go. On the last lap it all worked perfectly. Corner will be back in action over the August Bank Holiday weekend at Cadwell Park, Lincolnshire.